The club went through a tumultuous off-season in which they saw the departure of several key players including Joses Nawo and Molis Gagame. However, their biggest loss is midfielder Henry Fa’arodo who has left for to join ASB Premiership side, Team Wellington. Former coach, Peter Eke has also been taken of the club’s roster for the remainder of the season. 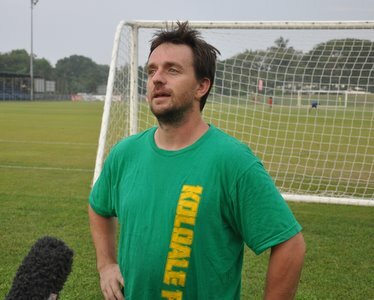 However, Koloale also had some good news this week and this came in the form of the arrival of American, Jeffery Allen, who has now taken over from Eke as head coach. Allen was assistant coach under the reign of Eke. This position has now fallen to the club’s former midfielder Henry Koto. The team held their final training session at the AE Oval yesterday and worked on some tactical plays under the guidance of Allen and Koto. Morale amongst the players seemed to be in top notch as they enjoyed their session and the pairing of James Naka and Benjamin Totori was a key point of their drills. Allen says that the club is realistic about its chances in the O-League but are going to put their best team in each of their remaining matches. “At this stage we are aiming for overall quality in the performance of the team. We want to get our combinations to work right and get our new players to fit into their roles. We will take each result as they come but it is important to us that we display our competitiveness once again at this level with good tactical football using the already horned technical ability of our players,” Allen says. Allen made good of his word to bring up younger players in the club and his line-up for the Auckland City game has 6 national U-23 training squad players. The players are goalkeeper Shadrack Ramoni, defensive trio Isreal Koti Fanai, Freddie Kini and Francis Lafai, midfielder Augustine Samani and striker Ian Paia whose inclusion highlight a transition point for the club as they welcome the younger generation. Koloale were defeated 4-1 in their home-game against Auckland City at Lawson Tama and they face an uphill climb against the New Zealand side that are enjoying leadership status in the ASB Premiership. Allen, however, says that this time the advantage is with Koloale unlike in their first meeting and they intend to take the game to their opponents. “We now have a better understanding of how Auckland City plays and we have adapted our 4-4-2 format to be able to deal with their 4-3-3 system. We also know their key players and we aim to keep ones like (Manuel) Exposito under close guard because he plays well off the ball. Also, playing away from home reduces the pressure on the team as I believe my players will focus better,” Allen says. Allen explained that one of the major improvements they worked on was establishing a strong defence that will hold for 90 minutes. This was an area that failed them in their first leg defeat to Auckland City and saw them give away 2 easy goals late in the match. Koloale have not registered a point yet in the O-League season and they occupy bottom place in Group B. Auckland City is leading with 3 wins out of 3 for a total of 9 points. Amicale sit ahead of Hekari United on goal difference with both clubs tied at 4 points each.